Are you ready for the most wonderful time of the year? You know exactly what I’m talking about! We’re hurtling towards the season to be jolly but also the season for gifting, and Lookfantastic have committed to gifting you with 25 extravagant treats as you countdown to Christmas this year. 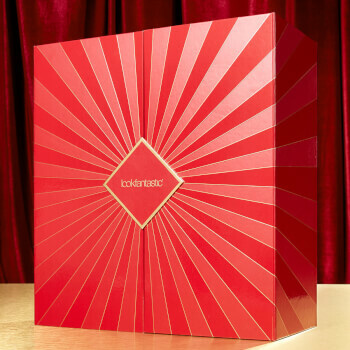 25 premium beauty and skincare products are housed in this show‐stopping red and gold calendar. With brands such as Illamasqua, Caudalie, Glamglow and Omorovicza, you’ll be in luxurious company this festive season. I opened all of the doors as soon as possible because I literally couldn’t help myself! Here are my favourites from this calendar and the full list of products below. I rave about this, a lot. It’s ideal if you’re just starting out with highlighter and would rather not glow to the heavens for a wearable daytime look. But the best thing about this is that it is so buildable, you could absolutely glow to the heavens if you wanted to! There is so much to the Beyond Powder that it’d be a miracle to even come close to hitting pan. Now this is an innovative and unexpected product. True to its name, this bizarre emerald green lipstick reacts to the warmth and pH of your lips to transform into a rosy red shade with a sheer finish. Moisturising shea butter and vitamin E works to hydrate the lips, so it’s almost like a lip balm that goes the extra mile to make it permanent fixture in your purse, especially during the colder months. I’ve found that the day doesn’t take any of the colour away as this product leaves a rosy red stain, so if you’re not one to reapply or top up your make up, this is the lipstick for you. My requirements for a liquid eyeliner is that it is blacker than black and stays put all day. This is 100% right up my street. A fine point pen is also my format of choice because I’m able to manage it with steady hands! I’ve always wanted to try Glamglow because there is much hype and love around their products but I’m not one to commit to a full sized product without making sure my skin is happy with it. The Lookfantastic advent calendar has a few sample sized products for you to test the waters, of which the Glamglow Gravity Mud Mask is one of them. This mask delivers a visible firming/face lift effect in a fun way because, why not! The white cream mask dries to an iridescent chrome upon application so that you can literally peel away the dirt and pollution from the day to reveal your brightened, firmed and renewed complexion! Is there anyone that doesn’t find peeling masks satisfying?? I also love this because I don’t have to keep an eye on the time or a set a timer for 15, 20 or 30 minutes before having to go and wash my face like most other masks. As soon as it’s dry or peelable, you’re ready to go! I’m still making my way through the calendar but these were products that instantly stood out to me! Vivian Yuen, hails from London and Hong Kong to capture personal style, beauty favourites, and travels to fun destinations around the globe on VIVIYUNN.COM Her global adventures have earned her a loyal following on social media and a highly engaged audience who return time and time again. She strives to inspire with creative, authentic and impactful content. It's time to reveal the best sellers of 2018 at lookfantastic Hong Kong. Read more about our top 10 beauty products now. It’s officially spring! We’ve curated a list of products that the Lookfantastic HK team have been loving this March. We hope this brings you further insight or inspiration to revamp your current skincare routine. Not sure what to have for your evening skincare routine? We are here to help! Discover our staff's current evening skincare routine now. Discover the Chinese New Year Limited Edition Beauty Box at lookfantastic Hong Kong. It contains 8 products from 7 brands with beautiful design, making it the perfect gift for Chinese New Year.